LORMAN, Miss. 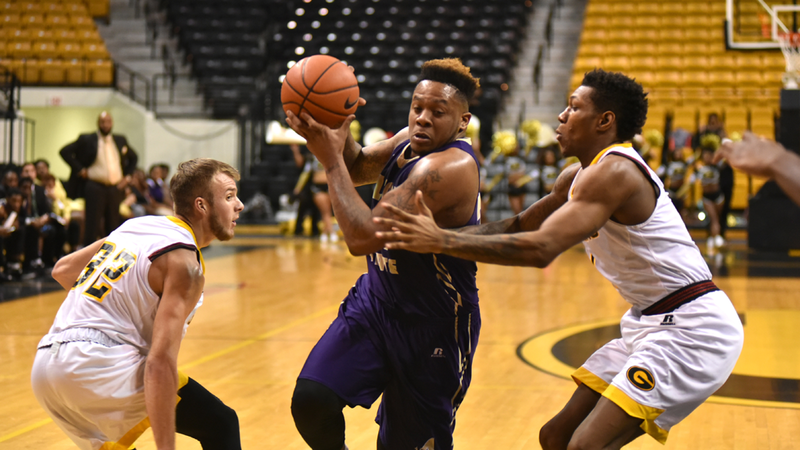 – Last year was supposed to be the year for senior Reginal “Monsta” Johnson from the Alcorn State University men’s basketball program. The 2017-18 SWAC Preseason Player of the Year was gearing up for his final season as a Brave after being named a 2016-17 HBCU All-American. The Monroe, Louisiana native led the team with 15.6 points and 7.1 rebounds per game as a junior to guide Alcorn to the SWAC title game and a second-place finish in the regular season. Johnson got the 2017-18 season started on a high note with six double-figure scoring games in his first seven outings including 20 points against Concordia. Additionally, Johnson joined the 1,000-point career scoring club on Nov. 22, 2017 after a 15-point performance against Yale. However, in the eighth game on Nov. 29, 2017, his season came to abrupt and tragic halt as he laid on the floor at Tulane grabbing his leg. Johnson had gone up for an offensive rebound and landed awkwardly on the base line. He stayed down for over 15 minutes as an air cast was placed on his right leg. With his family, coaches and teammates standing by, Johnson was taken out of Devlin Fieldhouse on a stretcher and transported to a nearby medical facility. Johnson was diagnosed with a broken fibula and tibia in his right leg. A rod was placed in his leg in December 2017 and sewn back together. The 6-5 forward missed the remained of the season, and had to wait to see if he’d be granted a medical redshirt to play another year. The shorthanded Braves finished the year 11-21 overall and 7-11 in conference. Alcorn entered the SWAC Championships as the No. 7 seed, but was knocked out by No. 2 Prairie View A&M in the first round 87-71. Johnson had a second surgery in April to have a rod placed in his other leg to prevent a potential break in his left. The procedure was recommended by doctors after examining MRI’s on both legs. It capped an injury-plagued season for the Braves, as Johnson was one of five student-athletes who were forced to sit out along with Khari Jabriel Allen, Harold Givens, Avery Patterson and Noah Plain. All but Patterson are still on the roster. Still working on his academics, Johnson graduated from Alcorn with a Bachelor’s degree in general studies and a minor in mass communications in May 2018. “Graduation was a great feeling because I’m the first in my immediate family to do so. It was a life-changing moment for me, and it also inspired both my sister and father as they’re both back in college now,” Johnson said. Johnson rehabilitated his legs, underwent therapy four times a week and started playing basketball at a slower pace over the summer. He continued to lift weights and tried to maintain his form. Johnson received more good news in August when he was officially cleared by the NCAA for a medical redshirt. As the season approached, Johnson was getting closer to 100 percent but it was unclear whether he’d be ready to go for the season-opener. He made the trip to Tulsa for game one, but did not see action. Johnson made his return to the court Friday for the first time in nearly 12 months as he logged 21 minutes off the bench against Blue Mountain in the team’s second game. He aided the Braves to a 79-55 victory with 14 points. It was his 56th career double-figure scoring game. Johnson is up to 1,053 career points at Alcorn. In addition to his 2016-17 HBCU All-America honor, he was named to the SWAC All-Conference Second-Team, SWAC All-Tournament Team and NABC All-District Second-Team. Johnson is currently pursuing a master’s degree in athletic administration from Alcorn. He said his goal is to give back to his community, become a role model for younger kids and become a high school athletic director.